Abstract. Studying behavior in economics, sociology, and statistics often involves fitting models in which the response variable depends on a dummy variable—also known as a regime-switch variable—or in which the response variable is observed only if a particular selection condition is met. In either case, standard regression techniques deliver inconsistent estimators if unobserved factors that affect the response are correlated with unobserved factors that affect the switching or selection variable. Consistent estimators can be obtained by maximum likelihood estimation of a joint model of the outcome and switching or selection variable. This article describes a “wrapper” program, ssm, that calls gllamm (Rabe-Hesketh, Skrondal, and Pickles, GLLAMM Manual [University of California–Berkeley, Division of Biostatistics, Working Paper Series, Paper No. 160]) to fit such models. The wrapper accepts data in a simple structure, has a straightforward syntax, and reports output that is easily interpretable. 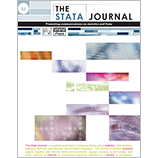 One important feature of ssm is that the log likelihood can be evaluated using adaptive quadrature (Rabe-Hesketh, Skrondal, and Pickles, Stata Journal 2: 1–21; Journal of Econometrics 128: 301–323).